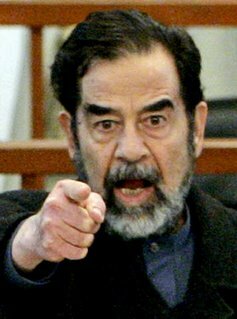 Saddam Hussein is to my generation what Adolf Hitler was to many generations ago. He was a ruthless dictator who did not despise the killing of his own people all in the name of power. We've all heard the accounts of his brutal rule over the years and cheered with the Iraqis when he was found hiding in a hole. He was tried and found guilty for crimes against humanity. Last Thursday I sat with my mouth opened and in shock at the news that he would be hanged as a result of his crimes. Now, I am not prepared to debate the death penalty here, but I could not believe a government trying to establish legitimacy, respect, and a democracy would hang someone--let alone its former ruler! Saddam Hussein was created in the imago dei--the image of God. All human beings bear the image of God. Scripture reveals this truth early in Genesis at the creation of man and woman. Sanctity of life is important because though all people may not know it, they bear the image of their Creator. (That is why I am an advocate against abortion and stem-cell research which destroys embryos.) So as an image bearer, I can't help but to wonder if Saddam died in a just manner? I don't know all the answers, but I do have a lot of questions. What do you think about the manner in which Saddam Hussein died? Despite all of the political jargon being discussed in the media, one thing I do know is that God loves all people of all nations...even those who denounce His Son. Saddam died a sad death. His last words were uttered in allegiance to Allah, declaring him as the one "true" god. Perhaps that is what I am even more sad about...he died not knowing Christ. I wonder, did anyone ever present the gospel to Saddam? Did he know of Christ's sacrifice for him? Did he know of God's love? Well, I guess I will never know the answers to those questions. I think my saddness for Saddam really translates into a saddness for the world. We live in a fallen, broken world marred by the effects of sin. Sin is horrible. God has opened my eyes to its ugliness and the beauty of the Cross of Christ. God's desire is that none would perish, but have everlasting life through His Son Jesus Christ. Who will go on our behalf?" "Here am I. Send me." I understand your sadness and your point. It would serve us well to pray for all our national and world leaders, regardless of their party affiliation or race, that they might lead their nations towards a lasting peace and away from hate.